Steiff 1905 Replica Discounts Apply ! Made from cuddly soft soft White Mohair, Fully Jointed. A replica of a Steiff classic disk jointed bear that appeared in 1905,He has five claws on each paw, just like the original Steiff bears from this time period. 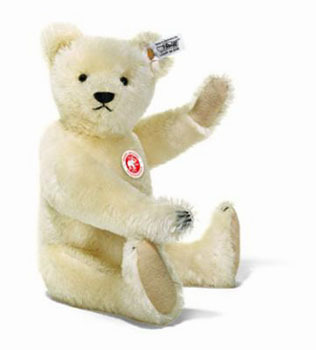 This bear is part of Steiff's 2005 Exclusive range.